Birthday Magic & Juggling Show! Lots of fun and exciting tricks. Over 15 years experience with great reviews! 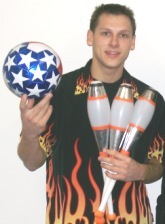 Starring the #1 U.S. Juggler as seen on ESPN! Juggling can be adjusted for any size space. Great to watch for ALL AGES! Balloon Sculpture with Balloon Art for Each child! Make Birthday person feel special with a Special Deluxe Balloon Sculpture. Low price - great value - compared to other Birthday Party entertainers. Click to schedule. For a fun and exciting Birthday Party Magician book Chris "JuggleBoy" Fowler. Much more fun than just a Magic Show because the Juggling adds more variety for your guests. Based in Raleigh, NC. Will also do Magic Shows for Durham NC, Cary NC, and beyond! Birthday kids having Fun with balloons! Click to get your exact quote. We are based in Raleigh, NC. Other areas will likely cost more because of travel costs. Entertainer will be at the party for about 45 minutes to 1 hour (unless you schedule extra time). We would love to help you make your party extra special!! Great Entertainment for Kids Birthday Party, Children's Party Magician, Magic Show, Balloon Art, and Parties of All Ages!